SANCTION X - THE LAST DAY (CD) | Online Shop | Wizard LTD. 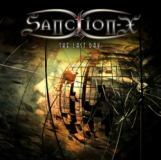 Album: "THE LAST DAY (CD)"
Sanction-X consists of well known German musicians out of the German Metal Rock scene. In January 2008 the band was founded by two musicians, Ebby Paduch (Stonefield, D.T.F., Infinitiy’s Call ) and Robby Bцbel (Talon, Frontline, Evidence One). Over time the band grew in size with the addition of Roberto D’Amico (D.T.F, Eternal Darkness) on bass guitar, Ben Eifert (Constantine) on Keyboards, and drummer Peter Langer (Stormwitch, Armada). The band compositions feature good grooves, driving Riffs and easy-to- remember melodies. The music can be described as melodic Metal Rock with a classical and progressive influence. The band’s first album “The Last Day” was produced by Robby Bцbel, long time active in the Metal branch as producer and musician. The band’s lyrics have to do with a wide range of contemporary themes including criticizing society in real life.